Ashford Choral Society, founded in 1857, has a current membership of about 120 singers, but is always pleased to welcome new members, especially tenors and basses. It normally gives three to four concerts each season, during the period September to May. Each year there is an opportunity to perform some of the major works in the choral repertoire, with leading soloists and a professional symphony orchestra. The conductor, Mark Deller, has an international reputation as a choral conductor, working with choirs in France, Belgium, Holland, Switzerland and South America. 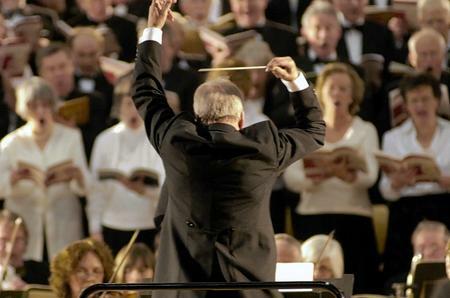 Having been conductor of Ashford Choral Society since 1970, he will be retiring at the end of this season, when he will have conducted his 50th Easter concert with the Society. Recent concerts given by the Society have included Elgar’s The Dream of Gerontius, Mendelssohn’s Elijah, Brahms Requiem and Nänie, Fauré’s Requiem and the unaccompanied Mass in G minor by Vaughan Williams. This coming season we will be performing the first three cantatas from Bach’s Christmas Oratorio and Verdi’s Requiem in the splendid Colyer-Fergusson Concert Hall in Canterbury, Mozart’s Requiem in Wye Parish Church, as well as our traditional Christmas Carol Concert in Ashford Parish Church. Come and join us, either as a performer or as a member of the audience. And remember …. if you are a student, or under 25 years of age, it costs you nothing at all to become a member of the Society! Ashford Choral Society is a member of the National Association of Choirs and the Ashford Federation of Arts.